Song and dance in the key of life: That’s the irresistible appeal of La La Land. Damien Chazelle’s joyous throwback musical tethers its razzle-dazzle to some semblance of reality—emotional and economic at least—even as its characters literally float on air. Chazelle, who broke out two years ago with the hellish music-school psychodrama Whiplash, dips one tapping toe into Old Hollywood fantasy and the other into a sea of everyday disappointments. The dichotomy announces itself from the inaugural number, a freeway traffic jam that becomes a group showstopper, the morning commuters leaping from their vehicles and belting their aspirational hearts out, all while the camera snakes around fenders in a single, virtuosic take. It’s an absurdly crowd-pleasing commencement with a telling punchline: Everyone crawls back into their cars, the festive tune replaced by an ordinary chorus of honking horns. Cue title card. 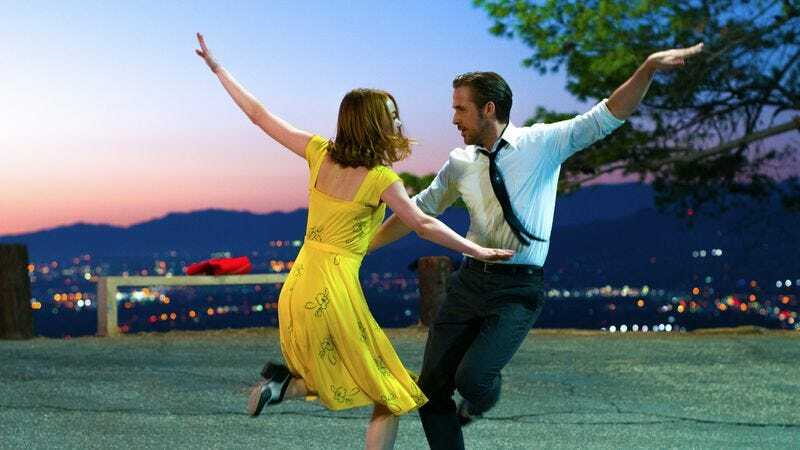 Opening with the retro insistence that it’s been “presented in CinemaScope” and closing with a tribute to two of the greatest endings in the history of big-screen musicals, La La Land is undeniably self-conscious about its place in cinematic history. The movie’s plainest antecedents, by din of pastel color scheme and melancholic undercurrent, are the human-scaled operas of Jacques Demy, including his timeless Umbrellas Of Cherbourg. By folding the French director into the kind of backlot spectacle he was already riffing on, Chazelle builds homage on top of homage. But his pastiche is far from impersonal; it references with soul and purpose. The people on screen, after all, are constantly squaring their lives against showbiz legacy, too. That goes especially for Mia (Emma Stone), a budding actress who works on the Warner Bros. lot as a barista, aggressively auditions for parts she never gets, and plasters her bedroom wall with the inspirational visage of Ingrid Bergman. In an act of cosmic matchmaking, Mia keeps running into the same ornery motorist she annoys in the first scene: struggling jazz pianist Sebastian, played by a Ryan Gosling who’s cranked his cranky charm to 11. Fed up with Hollywood (“They worship everything and value nothing,” he complains) and hung up on the legends whose careers he covets, Sebastian is so stubbornly committed to “real” jazz that he can’t hold down a job playing standards at a swanky restaurant; he’s a cousin to both the maniacally driven drummer of Whiplash and Oscar Isaac’s hopelessly principled Llewyn Davis. But there’s a glimmer of something more beneath his cynicism, and Mia and Sebastian are drawn to each other’s respective passion. La La Land traces their salty-then-sweet courtship by season, watching as it evolves from mutual dislike to flirtatious antagonism to head-over-heels romance. But can their love story survive the couple’s parallel professional woes, the city’s indifference to their ambitions? Whiplash established Chazelle as a major American talent—a director precise in his craftsmanship and synced to his characters’ nervous systems. In its jaw-dropping final minutes, the film also revealed a shameless showboat waiting in the wings. There are moments in La La Land where that Chazelle, the unapologetic grandstander, threatens to gain full control; a few of his big musical interludes, like one that spins around a swimming pool at breakneck speed, are more technically elaborate than transporting. But as much as the writer-director lives and breathes for the choreographed excess of Busby Berkeley and Vincente Minnelli, he never loses sight of the relatable dreamers at the center of his bravado set-pieces. The aforementioned pool-party scene eventually stops time to usher us into Mia’s emotional sphere. And a number of the numbers take a more intimate approach—placing Gosling and Stone against the sprawl of Los Angeles for a tap-dancing duet (complete with street light, for the full Singin’ In The Rain effect), or turning one of Mia’s auditions into a fragile ballad. La La Land also frequently offsets its artifice with a mundane touch, like a ringing cell phone that punctuates the falling-in-love sequence or a sloppily human gesture by one of the extras, each headlining their own, private Technicolor star-is-born story. And then there are the song themselves, the infectiously jazz-inflected ditties by composer Justin Hurwitz and lyricists Benj Pasek and Justin Paul. That dream team builds many of its earworms—the peppy opening number, a Broadway-worthy rallying cry for L.A. strivers; the lilting boardwalk lullaby “City Of Stars”—out from a single hum or whistle, to provide them an introspective foundation. (Keys are the other driving instrument, most crucially in the film’s piano-played main theme: a wordless lament in the aching mold of Umbrellas’ “I Will Wait For You.”) Neither Gosling nor Stone have perfect voices, but imperfection is part of the point; this is a musical that acknowledges the discrepancy between the spotlight fairy-tale Mia daydreams about and the more blemished reality of her wage-slave circumstances—in the other words, the L.A. of movie screens versus the noisy, gridlocked, unforgiving “real” version. What the two actors lack in vocal polish they make up for in commitment—and chemistry. 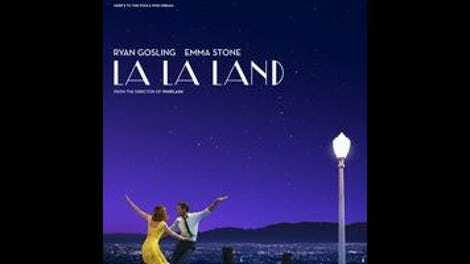 La La Land is the third film to romantically pair Gosling and Stone, after Crazy, Stupid, Love and Gangster Squad, and that history of onscreen relationships fortifies their playful rapport: They make a couple you want to believe in (and root for), even if Gosling never quite sells the transition from infatuation to full-on amour, the way he wordlessly sold the smoldering affection of an urban samurai who stomped a goon’s head into mush. No matter: Chazelle’s staging, particularly during a gravity-defying tango at the Griffith Observatory (following a screening of Rebel Without A Cause, naturally), does the swooning for him. And Stone, by contrast, is radiant. The movie owes so much of its twinkly pop resonance to her face in close-up, as Mia bares her soul for hurtfully disinterested casting directors, watches Sebastian—still a stranger—bare his own over a row of ivory, or stands like a vision in front of a silver screen, her features illuminated by the light of the projector. La La Land feeds off her heartache and elation. In playing a wannabe starlet, Stone achieves movie-star transcendence. All of this replicated dream-factory magic blossoms from a place of truth, the same struggles that animated Whiplash and the director’s black-and-white debut, Guy And Madeline On A Park Bench. The style may be adopted, but the focus on balancing relationships with the tough, sometimes crushing business of following your dreams is 100 percent Chazelle. When do you give up the fight and settle for security? When does it just get too hard to keep reaching for the impossible? La La Land hits a lull in the middle to address those prickly questions, dragging John Legend in for a less-than-gripping subplot involving an opportunity to bring jazz to the masses. It then rallies hard in the home stretch, culminating with a coda so pleasing but simultaneously bittersweet that shockwaves of feeling ripple backwards through the whole extravagant production. As with everything else in the movie, this grand finale owes debts of influence. But here, as elsewhere, La La Land sets its own tempo and moves to its own heartbeat. Cue smiles, tears, end credits.